As cyclists who use Page Street know all too well, there’s a tendency for motorists to jam up at the intersection with Octavia as they head to 101. And despite improvements and some traffic calming measures, it still turns into a bit of a mash up around the intersection, with cyclists trying to thread through the traffic jam. This weekend SFMTA rolled out a center-running green bike lane that helps formalize what most cyclists already do–pass to the left of the queue of cars waiting to turn right on Octavia. 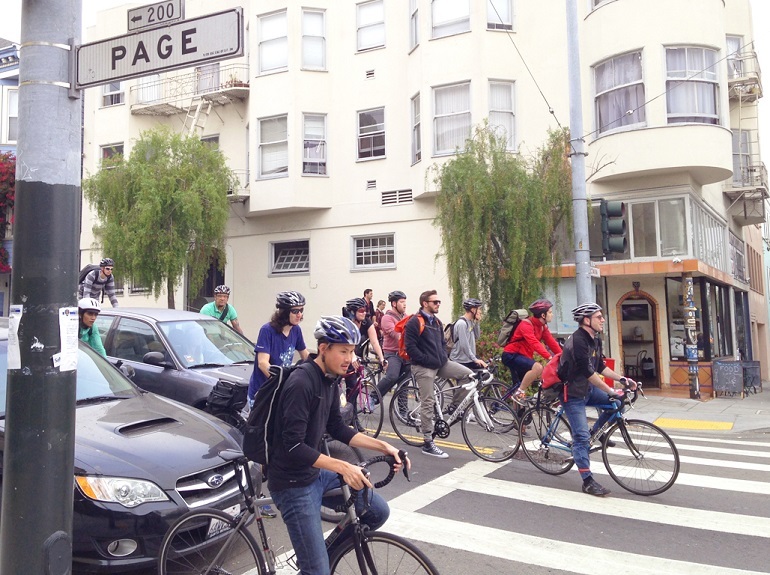 SFMTA wants to avoid the confusion that develops at the intersection of Page and Octavia. Photo: SFMTA. Planners sometimes call this “formalizing goat trails,” meaning, at least with pedestrians, one looks at the worn grass or brush to figure out where people are walking. This is a great way to figure what’s automatically the most convenient route and where to add asphalt or pavers. The same thing happens with cyclists: by observing intersections and streets, smart planners can change street configuration to accommodate natural behaviors, such as–in this case–cyclists passing a line of cars waiting to turn right. 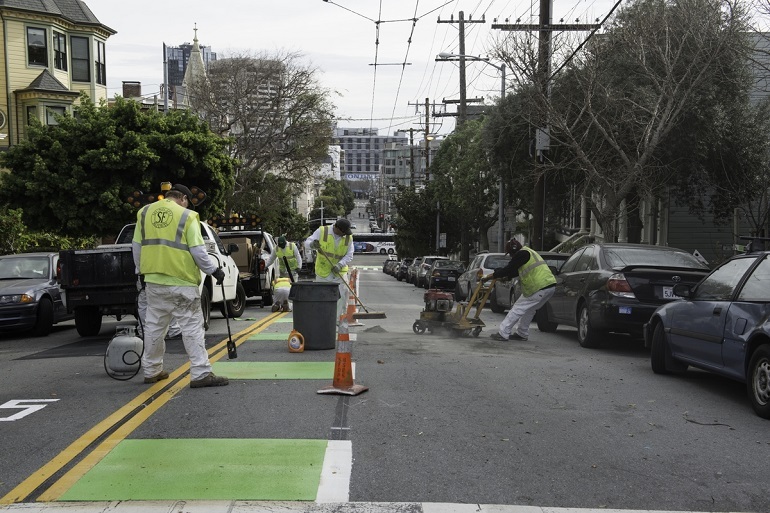 The SFMTA reports it also added green bike boxes and sharrow markings to provide more intuitive, comfortable and visible space for people on bikes to wait for the traffic signal. SFMTA added green paint to this center running bike route. Photo: SFMTA. While all of this is well and good, it’s still no substitute for fully built out, protected bike infrastructure. Painted markings are often sold as “better than nothing,” although even that’s not always clear. That said, the San Francisco Bicycle Coalition is pleased with the improvements, explained Chris Cassidy, the organization’s spokesman. “With all of the cars queued up at that intersection to turn right every morning, it just made sense for people biking to pass drivers on the left. The SFMTA’s efforts to keep people safe at Page and Octavia, and help us all avoid conflicts, deserve applause,” Cassidy said. Meanwhile, SFMTA is also launching an apprenticeship program to “jump-start meaningful careers for local residents while developing the SFMTA’s skilled workforce of the future,” according to a release from the agency. The program is open to interested high school seniors, graduates, veterans, college students or those looking to change careers. SFMTA also reports that many of their workers are reaching retirement age and this is a way to assure there are skilled technicians moving forward. To get more information, SFMTA invites people to join them at the City and County of San Francisco’s Winter 2016 Career Fair on Wednesday, Feb. 24 from 10 a.m. to 1 p.m. at the International Longshore and Warehouse Union Local 34 Hall, at 815 2nd Street. To get more information on the event, which is free, call 415.557.4800 or email DHR.Apprenticeshipsf@sfgov.org. 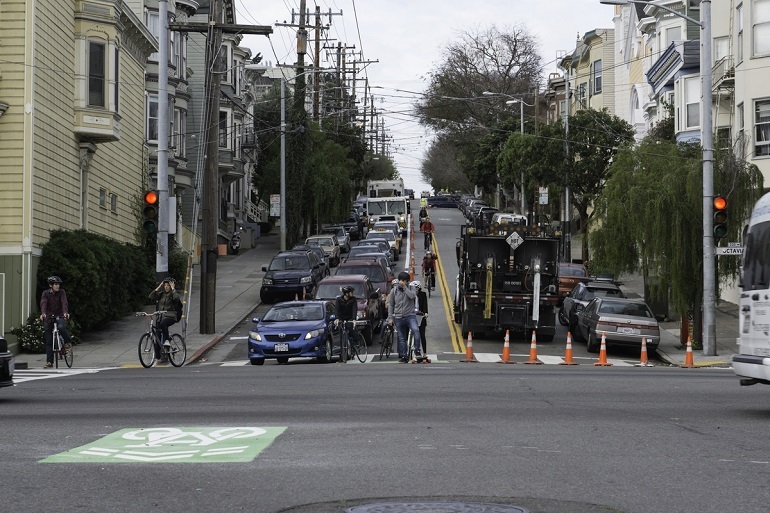 More than anything else, this will prevent the SFPD from harassing cyclists as they come down this hill to the left of cars trying to turn right. In one splash of paint, we’ve made a behavior that was considered unsafe and illegal, legal. Also shows how adding bicycle specific infrastructure can change the perspective of cycling behavior for those who don’t ride. Can drivers still go straight on Page or do they have to make a right on Octavia? Except I’d put at least a narrow concrete barrier between the bidirectional bike lanes and the car lane. Another traffic-calming device which could be used more in the area may already be found a block away on Rose St, where at Gough its traffic direction changes. This preserves local access for cars but prevents it being used as a cut-through E-W street. Implement block-by-block flow changes on streets like Page (while still keeping them bidirectional for people on foot and bike) and it’d go even further. No change has been made. The <1% of drivers who want to proceed forward still can wait in line for a long time and then drive forward when they reach the intersection. Any driver intending to go straight on Page getting themselves into that backup gets what they deserve. A long wait. 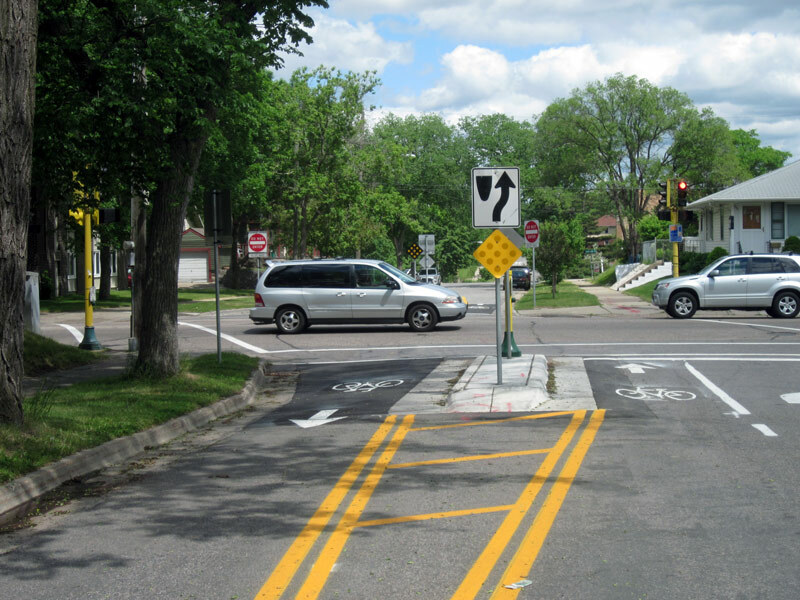 Misleading to imply that painted markings may not be better than nothing, but support it with a link to discussion of only one particular(ly ineffective) type of painted marking – the sharrow. No discussion of the type of treatment this article describes. Agreed, I don’t like seeing the uphill section narrowed like it was on Haight. Single-file car/bike uphills are a pain. Right?? Not ~4mos ago, weren’t the SFPD giving tickets to people biking who were passing on the left? Happy that this lane has formalized this behavior, but I also roll my eyes to this taking this long.